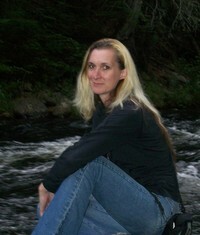 Today I have an interview with Jacqueline Paige, author of several paranormal books. With both series and stand alone books, she has something for everyone. That varies. I have written entire full length books (50,000+ words) in as little as three weeks. Mind you at that pace my wrists and hands don’t like me much. The longest time I‘ve taken to finish one is probably around the six month mark. Taking that long was not something I planned thought. I prefer to write at a fast pace, it keeps the plot fresh and the energy in the story. If I am forced for whatever real life reason to slow down or stop mid-way in a plot it’s really hard to get back into it. I have been very lucky to this point as far as covers go. I love them all. I’ll toss out thoughts and suggestions and always find myself shocked that the artist was able to get inside my head and make the perfect cover. A few times the artist has completely ignored what I thought I wanted and done their own thing and I’m so happy they did. That is such a hard question to answer. I have created with a lot of characters and watched them evolve into much more than I could have hoped for. I don’t have “A” favourite, but I can tell you why some of my characters have a special place in my heart. I’ll just do my females, because let’s face it I adore all of my male characters too much to narrow it down. Kasey – because she is so alive with energy, she makes me tired just watching her fly across the pages. She also makes me laugh and that’s never a bad thing. Leena – she is so calm and together, I feel peace just reading the words she’s saying. Rachel – with her careless and recklessness I find myself just a little envious but love her just the same. Cora – is so graceful and forgiving there is no way I couldn’t find myself drawn to her. Rhonda – I could never survive as she has, her strength and determination amazes me. Arianna – the torment of what she has gone through makes my worst day seem like a joke. I can honestly say I struggled to write her story and help her find the ending she deserved; of course she helped by throwing a few surprises my way during it. Jennah – her nerves of steel and attitude forced me to write the second part of her story, because I enjoyed spending so much time writing what she was showing me. Tess – I didn’t get to know her very well with her short appearances in From a Dream, but I definitely want to find out more about her. Jacinda – her sarcasm alone put me on her team right away. If I had to live through what she has, I don’t think I would be able to face things with the strength she does. Miranda – is blunt and determined to get at least one thing in her life to go her way. She made me laugh with her reactions to one bad moment after another; personally I would have given up long before she would ever consider the word. Maddy – what part didn’t I like about her? Not a thing. I sighed each time she did, wanted to throw temper tantrums when things didn’t go right for her and even felt the anxiousness each time she went through it. By the end of the story I felt like a mother wishing for nothing but the best for her.